Home > Discover > Case Studies > Turda SUMP: an ambitious yet accurate first SUMP from a mid-sized Eastern European city. Turda SUMP: an ambitious yet accurate first SUMP from a mid-sized Eastern European city. The first SUMP of the city of Turda is well structured with clear planning vision and also concrete measures to be implemented in the short term. It includes objectives, instruments (including financing plans) and measurable targets. It is a source of inspiration for small/medium size cities with little or no background in sustainable urban planning. Turda is located in Transylvania, north-west region of Romania. It’s population today is 55,000 inhabitants. It used to be an industrial city until the end of the communist period. Today Turda is an important touristic destination with over 600,000 visitors annually. It is also an important logistic pole at regional level, being located at the intersection of two major national mobility corridors. This influx of tourists, superimposed on local and transit traffic, in the context of an under-dimensioned road infrastructure is challenging for the liveability of the city. Irregular car parking, high traffic (the motorization rate is way higher than the Romanian average) also bring poor road safety conditions (the serious injuries increased by 30% during the period 2012-2015). Turda has organised its strategy on 5 pillars: accessibility, integration, sustainability attractiveness, smart city. The targets of the plans are as follow: an increase in public transport usage from 21% to 30%, an increase of cycling modal share from 6.7% to 13%, an increase in the share of pedestrian travel from 19% to 27%, and a decrease of usage of personal cars 53% to 30%. These overall long terms objectives will be reached through the implementation of concrete measures focusing in particular on shared mobility. •	Turda will implement an automated bike-sharing system of 27 stations and 356 bikes integrated with the public transport service. It is estimated that the implementation of this system will reach 200 daily users of which 10% will be using it in conjunction with the local public transport. As a result, the cycling modal share will increase of 6.3 percentage points and decrease the CO2 and NOx emissions by 3.8 percentage points. •	Car-pooling will be encouraged through parking incentives. A parking policy will be set up in the center to decrease car pressure and illegal parking. The target of 1,000 daily users by 2023, will lead to a 25% decrease in the number of cars in the central area and will contribute to decreasing the modal share by 1.3 percentage point and leading to a 2% decrease in CO2 and NOx emissions. 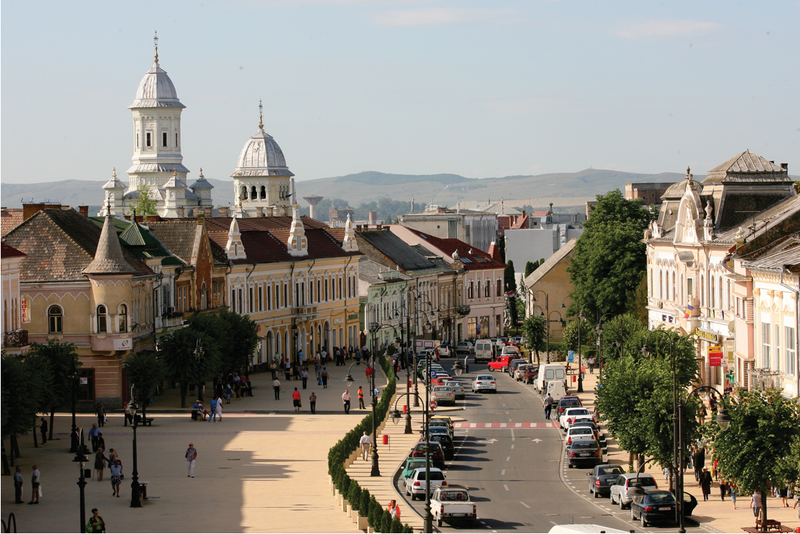 •	Car sharing will be implemented based on the system in running in the neighbouring city of Cluj (30km). A fleet of 10 electric cars will be available in Turda. ). It will reduce by 0.5% the auto modal share and will lower with 0.2% the NOx emissions in the city. •	A fleet of 10 vending bicycles will be rented to local entrepreneurs in order to steer the attractiveness of the city center for pedestrians. These measures will be integrated in a smart city approach, using IT tool such as apps. Users and businesses will then be able to receive real-time information. The overall process has been very transparent with several public consultations (online survey) and press conferences in the last year. The actions taken within the plan are concrete, have a significant impact and contain measurable targets. The city has undertaken research in order to scale the impact of each measure on air quality. The funding aspect is also included in the strategy with access to ERDF resources to be validated at national level. Although the SUMP was only approved last autumn, Turda has already started its implementation. For instance, the development of the bike sharing system is very well underway with public consultations already done and tendering process for the operator being open. As demonstrated by the selection of Turda as the winner of the 6th SUMP Award on the topic of Shared Mobility, the planning approach of Turda is considered by the jury of the award as particularly good. The jury also valued the outstanding planning vision of the SUMP in the context of a medium sized city with no background in sustainable urban mobility plan. Additionally, the jury of the EU SUMP award appreciated that Turda set concrete, measures with high impact and measurable targets giving a coherence to the overall planning approach. Its planning vision can be transferred to other similar sized cities.